Utility-scale wind power is providing clean, reliable energy for cities and towns throughout the country. Smaller, residential wind turbines are gaining popularity as an option for homeowners looking to make a renewable energy upgrade. At CaliforniaFIRST, we're here to help you finance your wind energy upgrade. Windmills, the predecessors to wind turbines, were historically used for purposes like grinding grain and transporting water. Today, we use wind turbines to generate electricity. In California, the total wind power capacity has grown by almost 350% in just 14 years. This growth, along with improvements in battery storage and grid-connection technology, means wind power is an increasingly reliable source for alternative energy. Wind turbines use blades to capture wind energy. The rotating blades turn a shaft inside the turbine and connect to gears that increase rotation speed, which power a generator and produce electricity. Fortunately, using wind energy can significantly cut down on utility bills. The average California household today is paying 17.2 cents per kilowatt hour (kWh) for electricity and using more than 6,500 kWh per year (more than $1,100 per year). Though the size and type (whether horizontal or vertical-axis) of small wind turbines can vary, homeowners with properly-installed systems can expect to have most, if not all, of their electricity needs met by wind power. The installation cost for a system large enough to power an entire home is about $30,000, according to estimates from The American Wind Association. The Department of Energy reports that this cost has decreased more than 90% since the early 1980s. A new wind turbine system, however, still requires a large upfront investment for homeowners. That's where our financing comes in. Our Property Assessed Clean Energy (PACE) financing is designed to provide 100% upfront funding for clean energy upgrades like wind power. Once your upgrade is complete, you'll begin paying back the cost of the installation on your property tax bill over a flexible payback period. Check out more of our program's unbeatable benefits here. 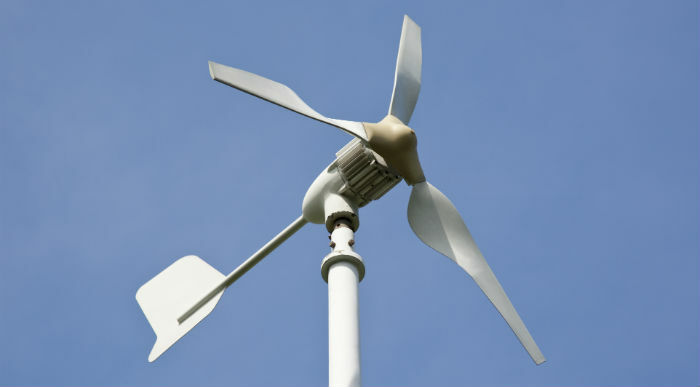 There are a few things to take into consideration when thinking about installing small wind turbines. First and most importantly, make sure your area gets enough consistent wind to make the upgrade worthwhile. There are a variety of wind resource maps online that will help you start your research. Make sure your town or neighborhood's zoning laws comply with the size and height of the wind turbine you are considering. Lastly, an experienced CaliforniaFIRST Registered Contractor will be able to determine whether or not your property is suitable for wind power by taking specific wind measurements to determine the feasibility of a system. If you're considering making the switch to wind power for your home, check your eligibility for our financing or call us at 844-589-7953 to learn more!